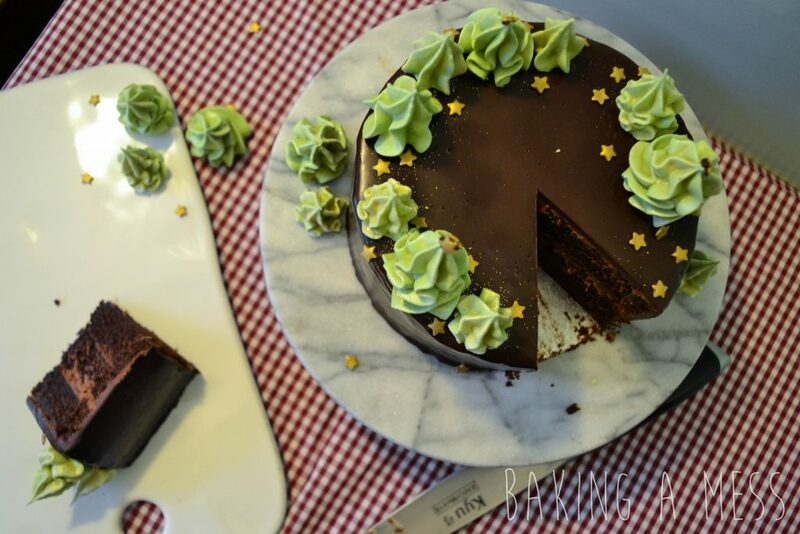 An indulgent chocolate cake with a festive spiced twist. 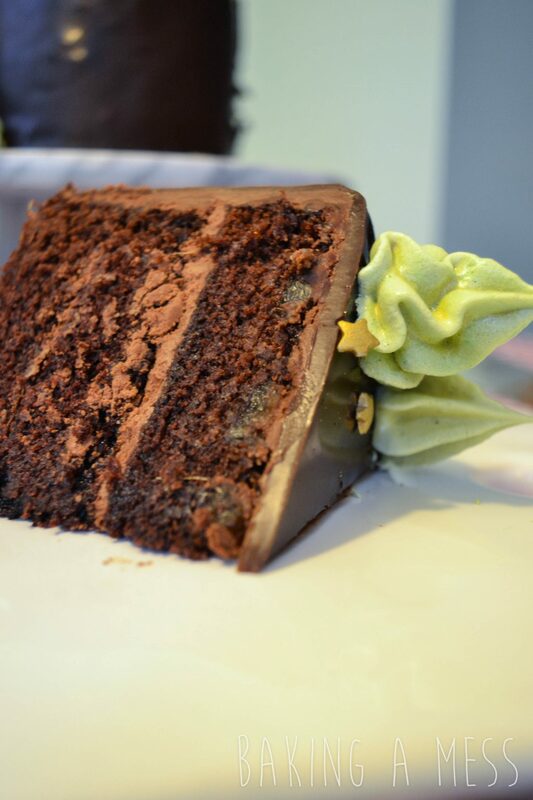 As far as flavours go, chocolate and ginger is easily one of our favourites. And sticking to our annual tradition of making an alternative christmas cake, this was an easy choice. 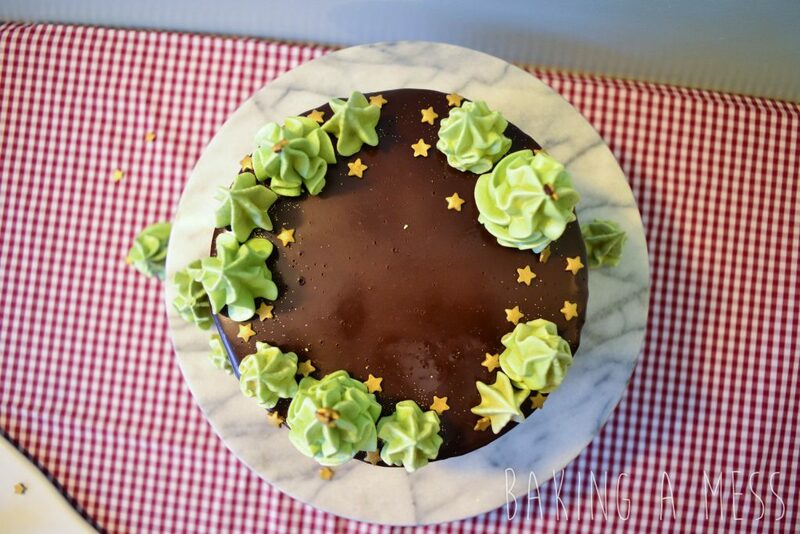 As the both of us are not fans of the traditional christmas fruit cake, we like to make something that’s still festive but caters to our tastes. Plus not to mention the fact you don’t have to make this like 2 months in advance! The past years we’ve made an orange and cinnamon cake and last year it was white chocolate and cranberry. 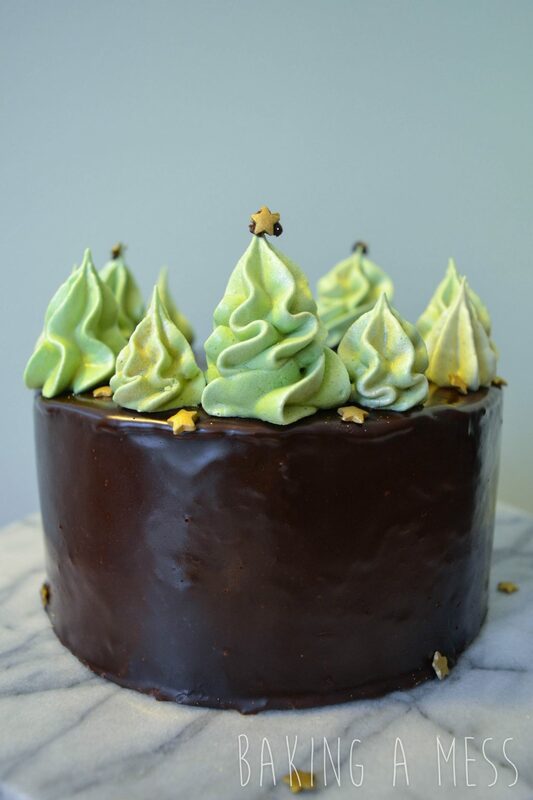 So this year finally came the turn of dark chocolate and ginger, we used stem ginger as it gives such a fantastic ginger flavour to the cake as well as adding even more moisture to an already delicious and moist chocolate sponge. After we’d baked the sponge we brushed the sponge with syrup out of the stem ginger jar to pack in even more flavour. 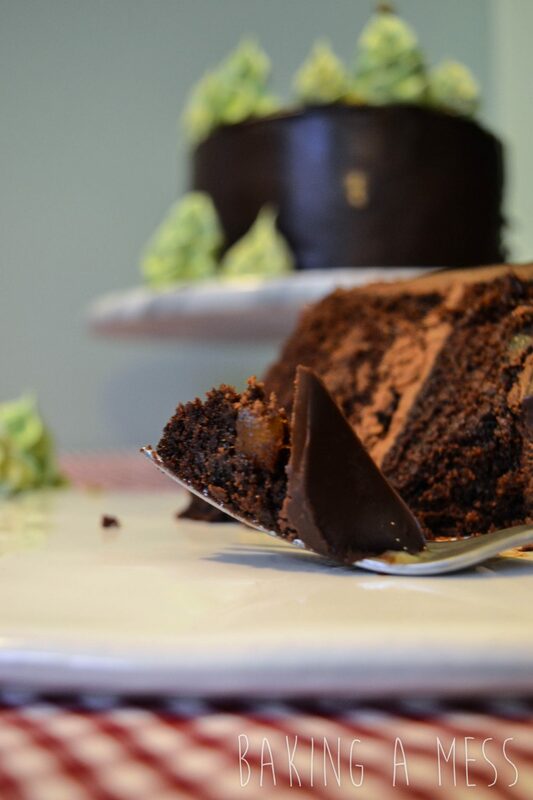 Then it was time for the ganache, you know we mean business when there’s 2 different ganaches! 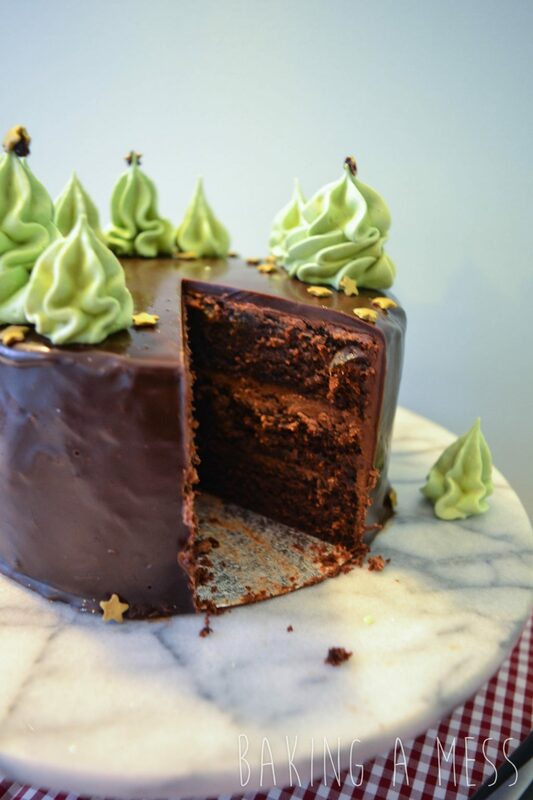 The first is to fill and cover the cake, a stiffer ganache made with both milk and dark chocolate that we then whipped to a light and fluffy texture, this really helps the cake not to become too dense! 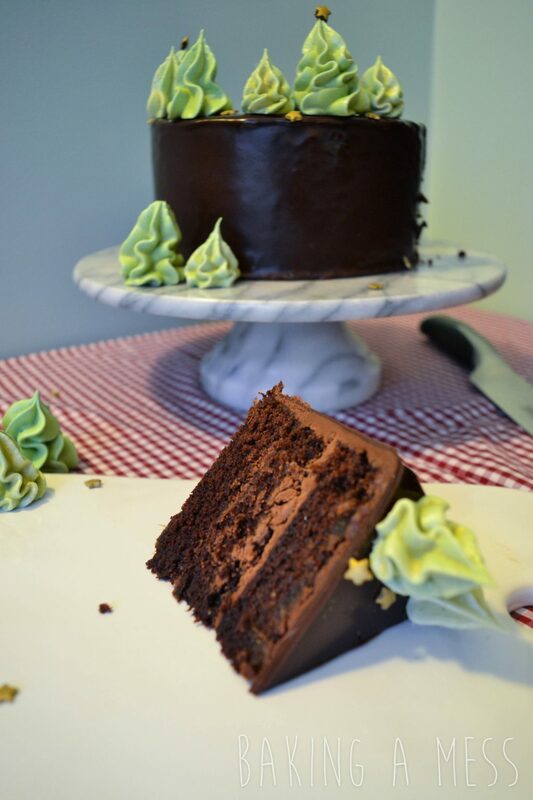 Ganache number 2 is to glaze the cake, giving an amazing shine and finish to really turn this cake into a showstopper! 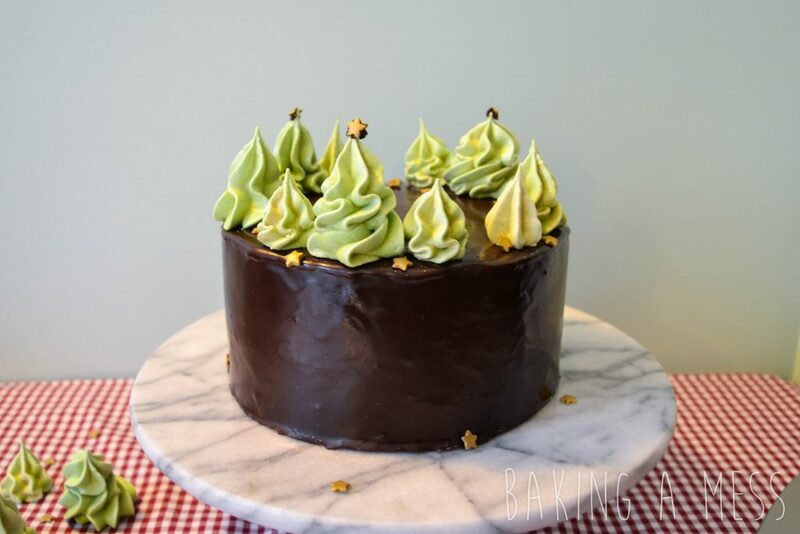 This ganache uses just dark chocolate and an equal ratio of cream, once you’ve made it, allow to cool for a little while, about 10 mins should do it. 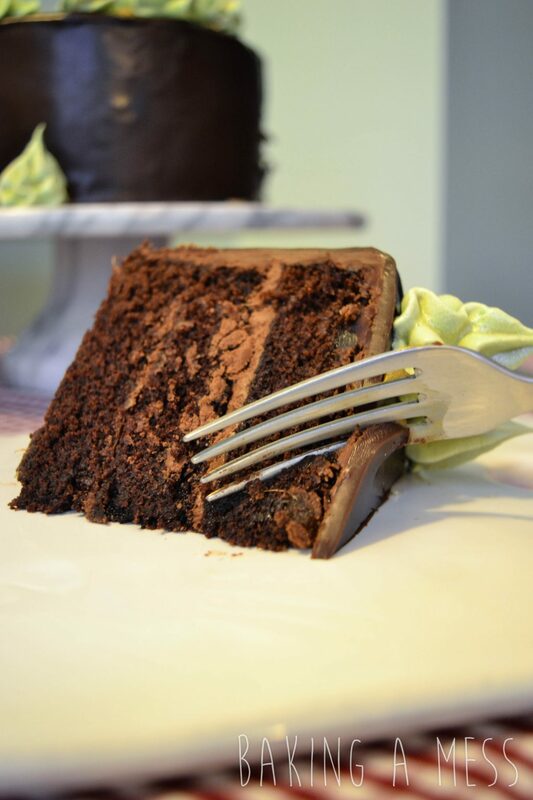 Then pour over the cake to give and even coating to the top and sides, set aside or ideally in the fridge to set before serving. You can decorate however you want, let your christmas spirit takeover! 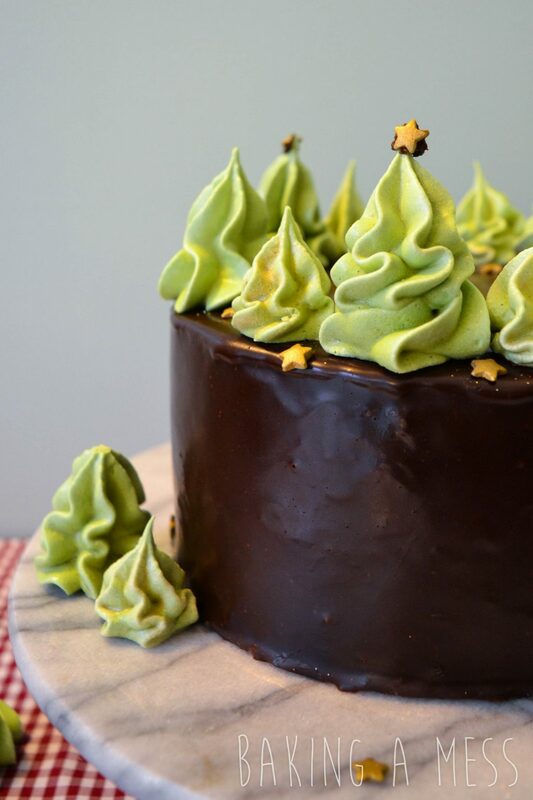 We chose to make some little green meringues that looked like christmas trees and a few gold star sprinkles for good measure!! 3 balls of stem ginger, finely chopped and about 1 tbsp of the syrup. In a large bowl or the bowl of a stand mixer fitted with the paddle attachment, add in the flour, sugar, cocoa, salt and bicarbonate of soda and mix for a couple seconds to incorporate everything. Add in the butter and continue mixing until you have a sand like texture with no big lumps of butter. In a jug add the eggs, milk, vanilla and yogurt, whisk together until combined, then pour the mixture in a slow, steady stream into the bowl whilst mixing on a slow-medium speed. Add in the stem ginger and syrup. Mix for 1-2 minutes until you have everything is fully incorporated and you have a smooth mixture. Pour the mixture into 1 deep 6 inch tin or equally into two 6 inch sandwich tins. Bake at 150 degrees for about 30-45 mins depending on what tin you use or until a skewer comes out clean. 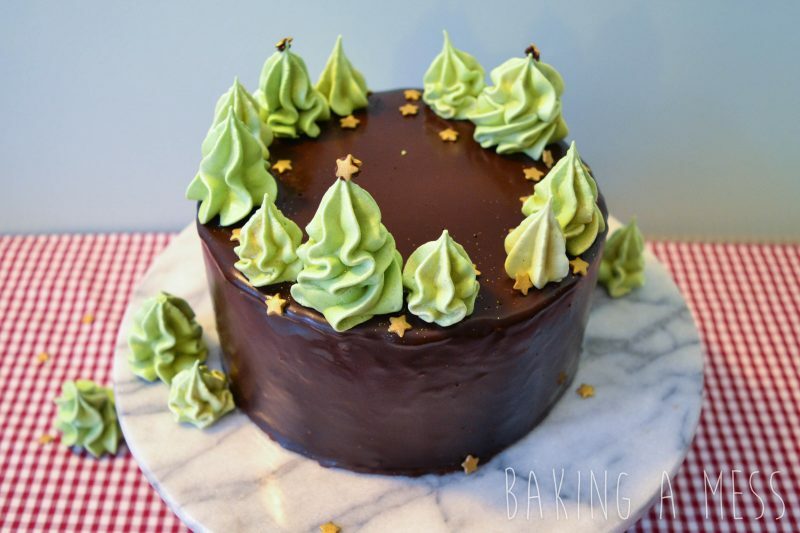 Allow to cool completely, and level off the top of the cakes, if you baked the sponge in one tin, slice into 2 or 3 layers. Brush the top of each layer with some of the stem ginger syrup. Heat the cream until it's almost boiling, you can do this either in the microwave or on the hop. Place the chocolate into a bowl and pour the cream over, allow to sit for a couple of minutes to melt the chocolate and then mix until the chocolate is completely melted and incorporated. Place in the fridge and allow to firm up for an hour or 2. 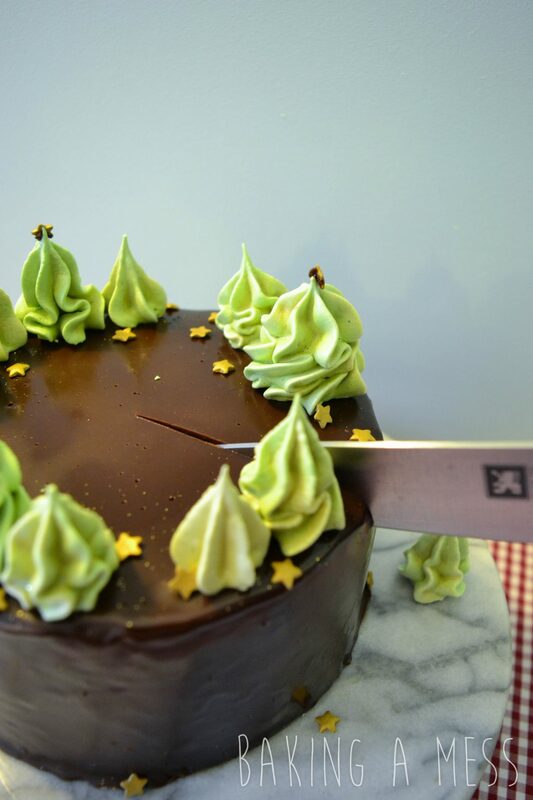 With an electric whisk or stand mixer fitted with the whisk attachment, whip the ganache until it's pale and fluffy. Sandwich together the cake layers with the whipped ganache and crumb coat. Put in the fridge to firm up for about 30 mins. 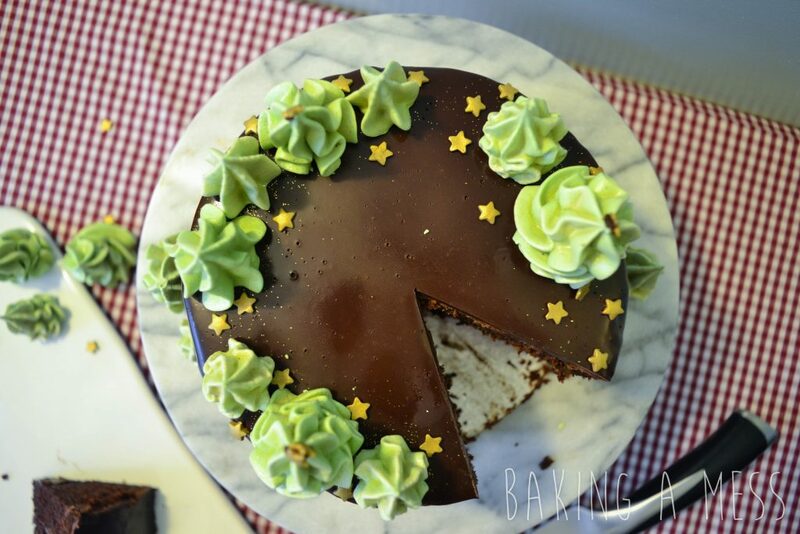 Then cover the cake with another layer of the whipped ganache and chill for a further 30 mins. Allow to cool down slightly for about 10 mins then evenly over the cake.